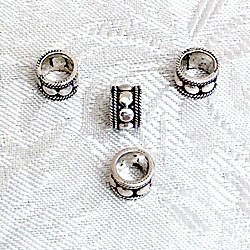 Technique: oxidized sterling silver in niello look, black in engraved points, shiny in embossed points. Usage: create volume with less mass by spacing apart large beads; sliding element on chains. The photo may not represent the quantity to be sold.